The Ham Radio Workbench K6BEZ Antenna Analyzer is a DIY SWR meter for analyzing the SWR of your HF antennas. 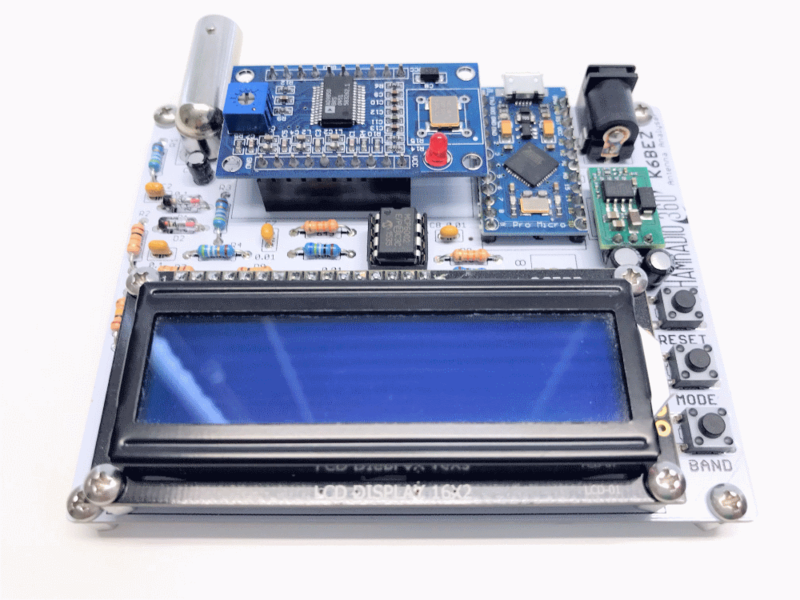 This design uses an Analog Devices Direct Digital Synthesis signal generator and an Arduino to sweep the HF bands to find the lowest SWR. The results are displayed on a 16x2 LCD. Lots of listeners customized this project to include better firmware, plotting on graphical displays, and using higher frequency DDS modules. The PCB is currently out of production. The DDS module is an Analog Devices AD9850. This component is available in a module format from eBay. It is unknoown at this time if the AD9851 replacement modules will work. The LCD is a standard 1602 16x2 LCD Display. We DO NOT USE the I2C or SPI models in this project. The Firmware was built in the Arduino IDE. When programming, make sure you have selected the 5V version of the board! Programming with the 3.3V version can disable or brick your Pro Micro 5V. A 3D Printable case has been designed by Rocket City 3d. This case can be ordered or it can be downloaded and printed yourself.